Bhatapara resident Tirith had been making average income by cultivating ancestral land with his father Bhagalaram Devganan. But later he adopted the business of dairy and progressed by leaps and bounds. The profit from this business was so huge that after his son Girish completed his management studies, Tirith made him quit his private job and tagged him along in the dairy business. Then he expanded his dairy business by incorporating advanced scientific ways. Today, they have 45 cows and are earning a profit of 60,000 rupees. Thirith Ram says that he has been practicing traditional farming for the past 35 years. They have been producing paddy, gram, wheat and also some vegetables. They had nine cows of indigenous breed at home, which used to give some milk. At that time, their annual income was about three lakh rupees. At that time his son Girish Devangan was doing a private job after finishing a management course. He called his son back in 2012 and started the advanced dairy farming under the guidance of the animal husbandry department. A grant of 4.5 lakhs Rupees was approved for Tirith Ram by the Rajya Poshit Udhymita. Prior to this, Girish went on a training program tour under Krishak Kaushal Vikas yojana in Gujarat and Rajasthan in 2014. 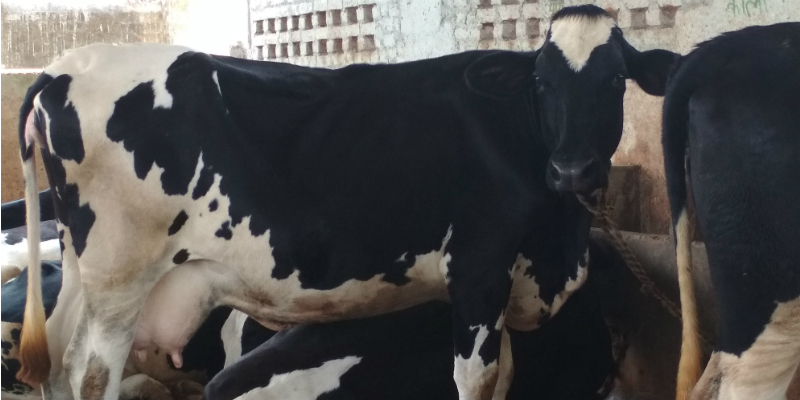 After gaining the necessary contemporary information of advanced cattle-rearing from there, he started implementing the knowledge to take the dairy business forward. Subsequently, from September to November of 2016, the training of dairy farming under the Muhkyamantri Kaushal Vikas Yojana was given at VTP Center, Animal Hospital, Bhatapara. This training also benefited them and they become more skilled in running the business of dairy. Further, from the Muhkyamantri Kausal Vikas Yojna, they were made aware of the Dairy Adyamita Yojana and Thirith Ram took full advantage of this too. Under this scheme, they got a grant of 4.5 lakh Rupees. They utilised this money and purchased 15 cows of advanced breed. This increased the production of milk. At present, they are capable of producing 350 liters of milk every single day and are earning a net profit about 60 thousand rupees per month. This has strengthened the financial condition of Thirith Ram and his son Girish in comparison to what it was earlier. Earlier, their annual income used to be three lakh rupees, which has now increased to eight lakh rupees per annum. After receiving the benefits of the scheme, Tirith Ram is now using chaff cutter and machines utilised for the purpose of milking. The 7 hectares of land that was initially used only for traditional farming, is now also growing fodder for the cows, so that they can get green and healthy fodder throughout the year. Thirith Ram says that today dairy has become his primary business, whereas agriculture has turned out to be his secondary business. Tirith Ram said, “The Veterinary Department has made a very crucial contribution in our success and we are working diligently to take our dairy business forward in the future.” Besides, Tirith Ram and his son are also, from time to time, providing practical and experimental information to various other people associated with the dairy business.